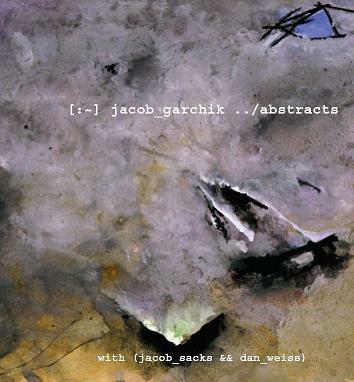 Abstracts, the 2005 cd on Yestereve Records by trombonist and composer Jacob Garchik, featuring Dan Weiss on drums and Jacob Sacks on piano. You don’t need a PayPal account to buy, only a credit card. With “Abstracts” (Yestereve), the trombonist Jacob Garchik offers a bouquet of appealingly compact excursions; here, as on the album, his partners in experimentation are the pianist Jacob Sacks and the drummer Dan Weiss. a floating or loping rhythmic feel…the themes sometimes have spaces that you can park a Hummer in, requiring not only the instincts of when to lay out, but the ideas that will reverberate through the ensuing spaces. All three musicians repeatedly show admirable abilities in these regards. These traits also carry over to the few occasions they work a groove, and the results are refreshingly sleek…These musicians are in motion, and it will be interesting to see where they go next. Jacob Garchik celebrates the release of Abstracts (Yestereve), an engrossing new trio session with pianist Jacob Sacks and drummer Dan Weiss. The lack of a bass player lends the session an airy intimacy not so far removed from the spacious drift of Jimmy Giuffre’s combo with Paul Bley, a sensation amplified by Weiss’s lithe drumming. All of the compositions on the cd except for Abstract 7 are available as sheet music.